Magnum Energy, a division of Sensata Technologies, designs a range of inverters to provide a cost effective, reliable solution for off-grid renewable energy applications and back up power. When the inverter mode is turned on, the direct current (DC) from the batteries is transformed to a pure sine wave alternating current (AC), which is similar to the voltage provided by your utility and is used to power electrical appliances connected to the inverter’s output. 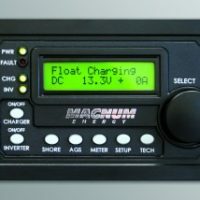 When an external AC power source (such as power from the utility or generator) is connected to the inverter’s AC input, the Magnum inverter/charger operates in Standby Mode and functions as a battery charger to convert the incoming AC to DC power and thereby re-charge the batteries in various stages. In addition, at the same time as charging the batteries, the inverter’s output can continue to power any connected electrical appliances. 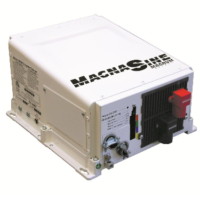 The Magnum inverters can also be used for backup power in a grid-connected location. When utility power is available the batteries will remain charged. In the event of a power failure, the inverter can supply power very quickly thus acting as an uninterruptible power supply. Alternatively, the inverter can be used as a standalone renewable energy power system. In this case, the inverter would run the AC electricity from the battery bank. 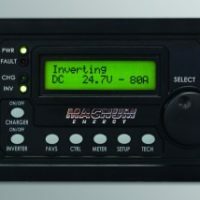 If the batteries are discharged, they can be recharged with solar, wind or a generator connected to the inverter. 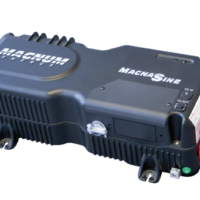 Magnum Energy pure sine wave inverter/chargers are designed to duplicate a sine wave. This is done by using many steps in the waveform to duplicate a sine wave that comes from a generator and this then becomes a digital representation of a sine wave. See www.magnum-dimensions.com for more information. 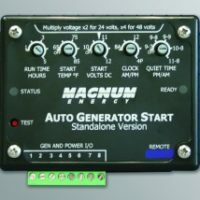 Ask us for free shipping on all Magnum Energy products. 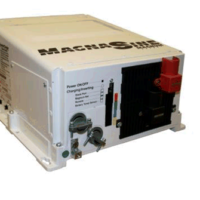 View cart “Magnum Energy MS2012 Sine Wave Inverter/Charger” has been added to your cart.